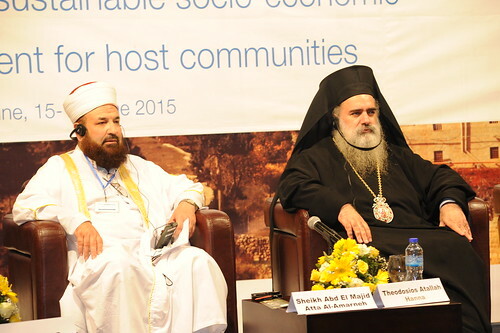 The Regional Programme for the Middle East has the honour to announce that an International Conference on Religious Tourism: Fostering sustainable socio-economic development for host communities, was held in Bethlehem on 15 and 16 June 2015. Travel and Tourism for religious purposes have been closely interconnected since ancient times. The first travels had religious motivation led by pilgrimages to the holy places of the various religions and up until today visiting the sacred places of Judaism, Christianity, Islam, Buddhism and other religions, remains one of the main motivations for travelers from around the world. The International Conference on Religious Tourism: Fostering sustainable socio-economic development in host communities provided a forum for tourism authorities, representatives of religious communities, the private sector, academia, international and regional development organizations, to exchange views, perspectives and experiences on how to develop and promote religious tourism as a tool for inclusive socio-economic development focusing on partnerships and initiatives that warrant the engagement and empowerment of local communities. 4. Promoting the participation of host communities and enhancing the socio-economic benefits of religious tourism at local level. The work carried out by UNWTO on tourism and world heritage sites, many of which have a religious significance, on tourism routes, often inspired by a religious character, and on spiritual tourism, contributed to enriching the debate.